The Garden City Scholarship Fund is pleased to announce the funny and popular Harlem Wizards will take on members of the talented Garden City faculty and staff in a family-friendly game of basketball on Saturday, February 2 at 1 p.m. in the Garden City High School gym. 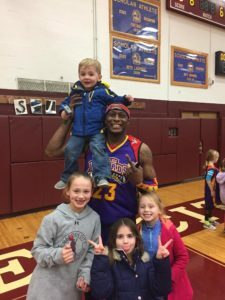 The Harlem Wizards fundraiser is a popular event so don’t wait to purchase your tickets! Advanced tickets are available for $15 online (plus $1.25 processing fee) or at St. Paul’s (cash only) Saturday/Sunday, January 26-27 (8:30 am – 12:30 pm). If available, tickets will also be sold “at the door” at the high school for $20. Doors open at noon; souvenirs and refreshments will be on sale. Children 3 and under are free. Proceeds from the event fund over $25,000 in annual grants awarded to deserving GCHS students, including the Julia Maloney Scholarship, The Unsung Hero Award and various Club Awards. The 2018 award winners included Emily Burns (Julia Maloney Scholarship), Colin McVicar (Unsung Hero Winner) and John O’Hare (Unsung Hero Nominator). In addition, the following seniors received our Club Awards: Kaylah Bozkurtian – Echo, Margaret Chiang – UNICEF, Patrick Creaven – UNICEF, Thomas Flanagan – Peer Educators, Lauren Hagan – FBLA, Jalen Hinck – Classic Movie Club, Alan Jian – Spanish National Honor Society, Hope Kelly – Latin Honor Society, Colleen Maclay – FBLA, Ryan Maresca – Envirothon, Natalie Martin – MAST Yearbook, Michaela McGovern – Best Buddies, Jack McKernan – H.O.P.E., Julia McNally – SADD, Layne Meyer – Sports Debate Club, Faith Nix – Italian Honor Society, John O’Hare – Latin Club, Ian Plummer – Science Olympiad, Margaret Riceman – The Miracle Club, Alexis Spera – Italian Club, Dean Van Noy – Stock Market Club, Samantha Wu – Fashion Club, and Kalie Yuen – Italian Honor Society. The support from the following generous sponsors of the 2018 Harlem Wizards fundraiser helped make these awards possible: Borrelli & Associates, Calogero’s, Cook & Krupa, D&J Refreshments, Doc O’Grady’s, Charlie Eschmann – Morgan Stanley, Garden City, Culinary Heights, Daniel Gale | Sotheby’s International Realty – Lisa Heaney and Fortune Heaney, The Law Offices of Douglas Fanning, LLP, Garden City Pizza and Catering, Guac Shop, Maccaro Orthodontics & Pediatric Dentistry, Mineola Bicycle, Thomas Murphy, Park Place Restaurant, SportLoft, Sweeney Connolly, Envie, Key Food, Leo’s, My Three Sons Bagels, Pellegrini’s, Raindew, Reflections and Old World Quality Corp.